:Lindsay McCaul's debut album If it Leads Me Back, produced by Jason Ingram and Rusty Varenkamp (Tenth Avenue North) reveals a songwriter of considerable depth and pathos with a shimmering voice that resonates with empathy and experience. A talented newcomer who will leave a lasting impression. 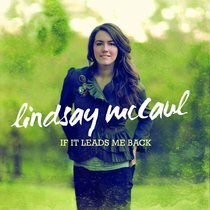 About "If It Leads Me Back"
Lindsay Mccaul is an American singer / songwriter who released her debut album If it leads me back in 2012. Even as a child she was fascinated with Christian Music, and began writing her own songs when she was 11 or 12. She studied linguistics at at Moody bible Institute in Chicago where she began leading musical praise and worship sessions, eventually becoming a regular worship leader at Chicago's Harvest Bible Chapel, where some of her original songs began to catch on with worship members and spread into the larger praise and worship community, eventually leading to a deal with Reunion Records.